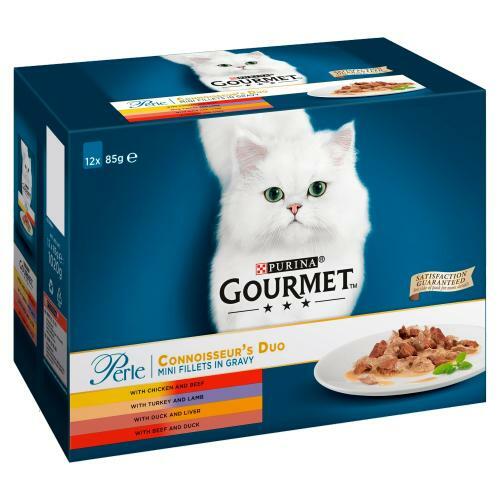 Gourmet Gold Perle Delicate Meat Duo are nutritionally balanced & thoroughly delectable recipes to tickle the fancy of even the most acutely refined cat connoisseur. Treat your furry sophisticate every day with exquisite morsels of meat or fish, cut into fine fillets & gently cooked in a sumptuously savoury sauce for a delight even the most discerning feline won’t turn their nose up at! Even better, this complete pet food provides complete nourishment, to keep your cat feeling healthy and looking beautiful every day. This mouth-watering Chef's Selection of elegant flavours, such as Chicken & Beef, Turkey & Lamb, Duck & Liver, and Rabbit & Game, ensures your pampered puss will be absolutely spoiled for choice! Ingredients: Meat and animal derivatives (meat 14%), vegetable protein extracts, fish and fish derivatives, minerals, various sugars.